In Pakistan, many women who decide to leave abusive marriages are signing their own death warrants. They risk being disfigured or murdered by men who believe it is the only way to restore honor to the family. Authorities in Pakistan rarely respond to reports of honor killing. The Human Rights Commission Pakistan and the Women Action Forum estimate that 1000 women are murdered each year, with little or no response from the government. 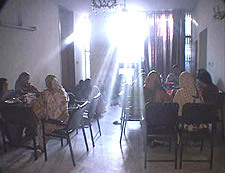 At the Dastak women's shelter in Lahore, women accused of tarnishing the family honor find a safe haven. Here, in this tidy building with a well-kept lawn, they live in safety, receiving both counseling and legal advice. Kubra is one such woman. After enduring repeated beatings, the 28-year-old fled to Dastak. We meet Kubra - armed guard in tow - on her way to a meeting with members of her family. They entreat her to return. Eventually, she agrees. Three weeks later, she is murdered, shot to death in her sleep. Through Kubra's story, and the stories of other women at Dastak, the film creates a portrait of one institution that is protecting Pakistani women, at least the women who can make it there. Tells the story of three unconventional social workers united by a common vision that transcends the antagonisms between their countries. Hossein's and Shaima's love is a story about honor, tribal laws, disgrace, fear, and hope for change in a war-ravaged Afghanistan. One woman's fight to have her daughter legitimized by the Moroccan judicial system. Filmed in Jordan and on the West Bank, investigates the terrible reality of femicide—the killing of sisters or daughters suspected of losing their virginity, for having refused an arranged marriage or having left a husband.